10/01/2019 :: Click Here to Download Photos for AU 85th & 86th Combined Convocation. 09/01/2019 :: Andhra University 85th & 86th Combined Convocation Live Stream. 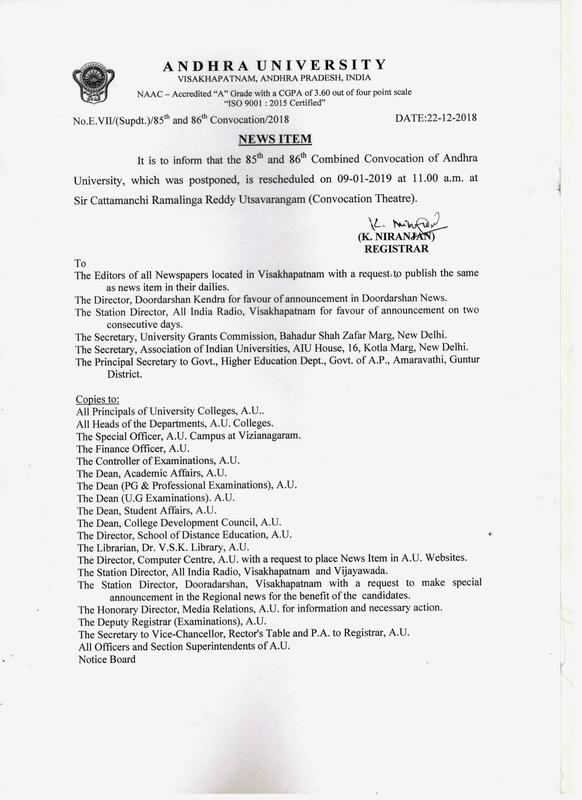 24/12/2018 :: It is to inform that the 85th & 86th Combined Convocation of Andhra University, which was postponed, is rescheduled on 09-01-2019 at 11.00 a.m. at Sir Cattamanchi Ramalinga Reddy Utsavarangam(Convocation Theatre). 04/12/2018 :: AU Best Researcher Award Application - 86th Convocation. 29/11/2018 :: AU 85th & 86th Combined Convocation Online Fee Payment. 29/11/2018 :: AU 85th & 86th Combined Convocation - Notification. 29/11/2018 :: AU 85th & 86th Combined Convocation - News Item. 29/11/2018 :: AU 85th & 86th Combined Convocation - Application form for PG/UG/PG Diploma/PG & UG Professional Courses. 29/11/2018 :: AU 85th & 86th Combined Convocation - Application form for Ph.D/M.Phil. 02/02/2018 :: Click here to download the 85th Convocation Notification (Paper clipping). 02/02/2018 :: Click here to download the 85th Convocation Notification and Application form. 27/06/2017 :: Click here to download the 83rd and 84th combined Convocations Best Researcher Award Application Form. 10/06/2017 :: Click here to download the application form The 83rd and 84th combined Convocation of Andhra University is scheduled on 29th July, 2017 at 3.30 p.m. in Sir Cattamanchi Ramalinga Reddy Utsavarangam (Convocation Theatre). The University shall have the powers, functions and objects to confer Degrees and other academic distinctions on persons who have carried on research under conditions prescribed. The Executive Council shall have power to confer Degrees and other academic distinctions on persons who have pursued approved courses of study in a University College or an affiliated College or oriental College, unless exempted there form in the manner prescribed by the regulations and shall have passed the prescribed examination of the University or shall have carried on research under conditions prescribed. A Convocation for the purpose of conferring Degrees and award of prizes or medals concerning such Degrees shall be held annually at such time as the Chancellor shall direct. It shall however, be competent for the Executive Council to hold additional Convocations, if necessary, in addition to the principle one. Subject to such terms and conditions of award as may have been provided in the case of individual prizes or medals where more than one candidate secures equal marks in a concerned subject or part of the examination which entities them for the award, the prize or medal shall not be divided among them but shall be awarded only to one of such candidates taking in to account his overall performance in all parts of the examination. Every candidate for a Degree or a Diploma who has studied in the University Colleges for such Degree or Diploma shall receive the same at a conversation either in person or in absentia. Every candidate for a Degree, Diploma or title who has studied in a College affiliated to or recognized by University for such Degree, Diploma or title shall receive either in person or in absentia the Degree, Diploma or title together with any prize or medal concerning it at a special function held at the respective College which has prepared and presented him or her for the Examination leading to the Degree, Diploma or title. Every candidate for a Degree, Diploma or title who has studied privately for the Degree, Diploma or title after having been duly exempted by the Executive Council from the production of the required certificate of attendance at a College shall be eligible to receive the same at a Convocation or at a special function held at any College affiliated to or recognized by the University at the candidate's choice either in person or in absentia. No candidate who had the benefit of grace marks in the qualifying examination shall be awarded any prize or medal. No Candidate who is otherwise eligible for a medal or prize shall be entitled to the prize or medal unless he s secure at least 50 percent of the marks in the subject or part of examination in Music but these will not be awarded at a convocation but sent direct to the candidates. The above provisions also apply to prizes and medals awarded for the pre-University Examination and Diploma Examination in music but these will not be awarded at a Convocation but sent direct to the candidates. No candidate who has already proceeded to a Degree Diploma or title and has been awarded his Degree or Diploma or title shall be admitted at Convocation or special function at a College as the case may be second time to the same Degree or title or Diploma not withstanding that he may have qualified in an additional group or branch or in an additional language or may have improved upon his earlier performance. An endorsement shall be made upon his Diploma setting forth further examinations passed by him , the dates of such examinations and the class in which he was placed provided that in the case of candidates who have appeared for the same examination to improve their class, they shall receive the same at a a convocation or function at a College as the case may be as specified in section 3 supra a second time to the same Degree after they surrender their earlier diplomas. Candidates for Degrees must submit their applications to the Registrar twenty-one days before the day fixed for Convocation for admission to their several Degrees in the prescribed by the ordinates. No person shall receive his Degree who has not thus sent in his application with required fee. The diplomas of the University hall be valid only if they bear the seal of the University an are countersigned by the registrar in the case ordinary Degree other than Research Degrees and Honorary Degrees . The Diploma of Research Degrees will be countersigned by the Vice-Chancellor. The Diplomas of the Honorary Degrees will be countersigned by the Officer conferring the Degree. The Executive Council shall from time to time, lay down the procedures to be followed at the Convocation and at special functions. Special Convocations for conferring Degrees or for other purposes may be held on such date and time as the Executive Council may with Chancellor's approval, determine. There shall be the following Degrees conferring and Diplomas awarded in the University. Doctor of Philosophy in Law. Doctor of Philosophy in Theatre Arts. Undergraduate Diploma in Physical Education. Honorary Doctorate Degree (Kreeda Prapoorna). The Degrees of D.Litt., D.Sc. and LL.D may also be given as Honorary Degrees. The Honorary Doctorate Degree of ‘Kala Prapoorna' (Sangha Seva) may be given in the Faculties of Engineering and Kala Prapoorna (Krishi) in the Faculty of Agriculture, ‘Kala Prapoorna' (Sangeeta), (Natya), (Nataka), (Chitra) or (Silpa) in the Faculty of Fine Arts and ‘Kala Prapoorna' (Sahitya) in the Faculty of ‘Oriental Learning'.